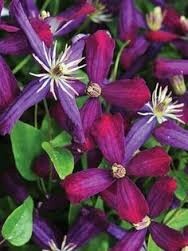 Clematis ‘Sweet Summer Love’ is a late summer blooming clematis like ‘Sweet Autumn’ that flowers sooner and longer and has cranberry-violet blooms. The showy, fragrant blooms start over month earlier. It is hardy in Zones 4-9 and prefers average well-drained, moist soil. Keep the roots cool by planting on the east side or in afternoon shade or by shading the roots with a low-growing annual, perennial or shrub. 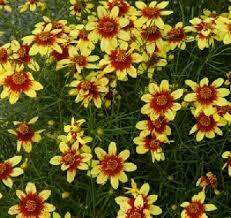 Coreopsis ‘Route 66’ is a threadleaf coreopsis with 2-inch burgundy and yellow bi-color blooms. The mounded two foot tall plants have excellent branching for multiple blooms all summer. It is easy to care for by planting in full sun and fertile, well-drained soil. Keep moderately moist, but it can tolerate dry conditions once established. It is listed as hardy in Zones 5-9, but has done well in our Zone 4 garden for two years. Delphinium ‘New Millennium Dwarf Stars’ are a great choice for those who love the look of traditional tall delphiniums, but don’t want something so tall. At just under 2 ½ feet tall, ‘Dwarf Stars’ never need staking and work better in windy sites than the taller varieties. 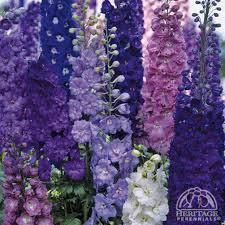 This mix includes purple, blue, mauve, pink, lilac and cream colored flowers. Some have contrasting central bees and others are solid colors. They have a busy, well-branched habit and strong flower stems. Hardy in zones 3-7, they are deer resistant, attract butterflies and hummingbirds and like full sun or part shade. 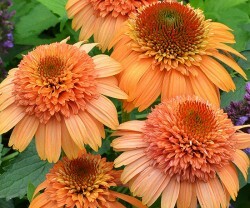 This new variety of Echinacea has large double blooms that are absolutely the color of ripe cantaloupe! They flower the first year with non-fading blooms that last from summer into fall. This heavy bloomer has strong, non-floppy stems with excellent branching on compact plants that are 24 to 30 inches tall. 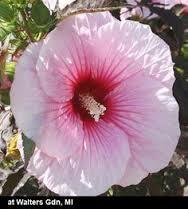 They are drought tolerant and deer resistant and hardy in zones 4-10. ‘Overdam’ has variegated foilage that starts out with bright creamy white margins that then fade to white with a pink flush. The upright clump of foilage will remain under 2′ tall. 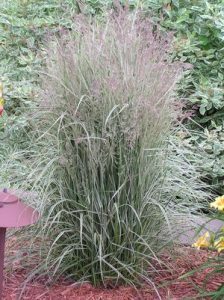 In late spring feathery plumes with sand-colored seed head appear reaching up to 5 feet tall. ‘Overdam’ prefers sunny,dry northern climates. It will grow in partial shade in the south. Be sure to provide plenty of moisture during extremely hot weather.Cut back to 6 inches in Spring before new growth begins. Propagate by division either in Fall or early Spring. 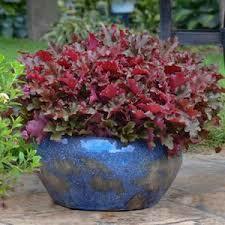 Heuchera ‘Cinnamon Curls’ forms a 9-12” mounded plant with stunning foliage in a blend of coppery-orange, red and purple. The glossy leaves are dense and ruffled. The panicles of small white blooms appear in early spring, but the real show is the eye-catching foliage. Grow in beds and borders or in mixed containers. It is hardy in zones 4-9, drought tolerant and likes sun or part shade. Hibiscus ‘Cherry Cheesecake’ has stunning 7-8 inch blooms that are white with magenta tipped ruffled petals with magenta veining radiating from the cherry red eye. They are relatively compact with a rounded habit. The plants emerge in late spring and can be pinched to increase the number blooms and keep them bushy. Grow them in average soil in full sun to part shade. They are drought tolerant, but can also be a bog plant. They grow 4 to feet tall and are hardy in zones 4-9. 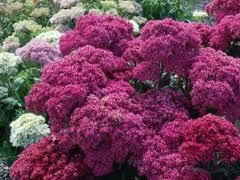 This variety of upright sedum has large 5-6 inch clusters of spectacular purple-pink flowers on strong, shorter stems that resist flopping. The smokey blue-green foliage is serrated and forms mounded compact clumps. Plant them in full sun to part shade, in average soil. It can tolerate dry or moist conditions and it is rabbit resistant and attracts butterflies. It is hardy in zones 3-9. This impressive Achillea has stronger, branched stems with a compact habit, unlike the weaker stems and open habit of older varieties. ‘Saucy Seduction’ flowers open and intense fuchsia pink then lighten to medium pink and are produced all summer for an extended bloom time. They are easy to grow in poor to average soil and tolerate dry conditions. They are deer and rabbit resistant and attract butterflies. Hardy in zones 3-8. 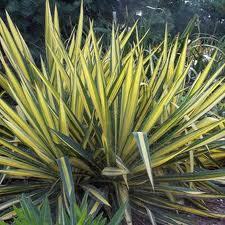 Yucca ‘Color Guard’ is a gold-centered variegated variety of Adam’s Needle that is 2-3 feet tall and wide. It features a basal rosette of sword-shaped leaves that are creamy-yellow with green edges. In late they produce a 5-6 foot tall flower stalk bearing panicles of fragrant, creamy white flowers. 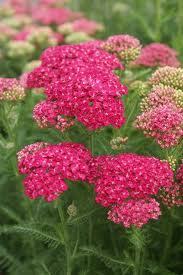 It is hardy in zones 4-10 and easily grown in light, dry to medium, well-drained soil in full sun. It is deer and rabbit resistant, attracts butterflies, and tolerates poor, dry and sandy soil and tolerates partial shade.